As you may already know, this year has been a slow one to getting on track due to scheduling conflicts and family matters that have come up. Thankfully the long wait has come to an end. 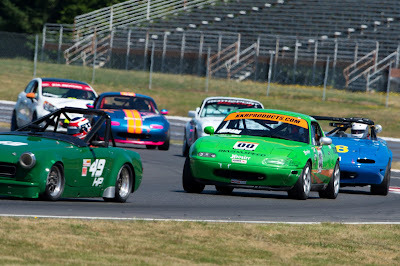 Last weekend both my dad and I raced our trusty green Spec Miata for the first time this year, and at none other than the 55th Annual Rose Cup Races at Portland International Raceway. It was an entertaining weekend with Dad and I sharing the car once again, him racing in SM and me in STL. With no practice sessions worked into the schedule, we went straight into qualifying. Dad qualified 12th in a field of nearly 30 Spec Miatas, and I qualified on pole for STL and running lap times that tied my personal best. Not bad for our first session on track for the year! 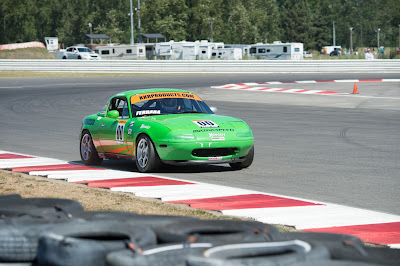 Race 1 of the Spec Miata Grand Prix was incredibly exciting to watch. There wasn't a lap that went by where there weren't cars somewhere going 2 or 3 wide. The top 7 were switching positions throughout the race, all contending for the lead. About halfway through the race a full course caution came out. After watching the cars lap and realizing our car was missing, my family and I rushed down to the pits to see what happened and make sure Dad was okay. Fortunately, Dad was uninjured, but the whole left side of the car was beat up and covered with rubber from the tire wall. What had happened is, as he was going through turn 12, he ended up too wide on exit and hit a dip past the exit curbing, this misdirected the car toward the tire wall at the exit. He tried to get it corrected, but the tires caught grip at the wrong moment and it was over from there. Just before impact he realized it was unsaveable and let go of the wheel. This not only saved him from potentially breaking some bones, but also allowed the wheels to move freely, dispersing the energy and amazingly nothing broke on the car. The front left fender was crushed in and rubbing on the tire, plus the mirror was gone, but all the damage appeared to be cosmetic. With only one race between his race and mine, we had very limited time to get the car together and determine whether I would be able to go out for my first race. With the help of Chris, Kenton, my dad and I, we were able to check over the car, make sure it was straight, and fix it enough to run my race. 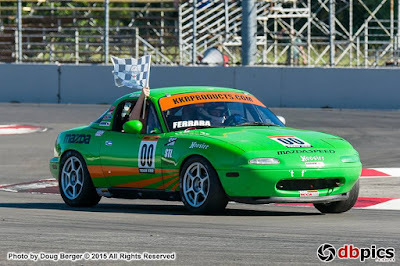 Since I drive a Miata on the street, I was able to borrow it for the race. I asked for a hardship lap just before my race to make sure the car drove straight, stopped, turned, and all of that good stuff. The hardship lap is out and back in, just enough to determine that the car was good and I was ready to race! For my race I was in a mixed group of over 30 cars with a large speed variance, including anything from Porsche GT3 Cup cars to Mazda Miatas and even a Kia Rio. This meant that traffic played a large role in the race. Most of my race was spent overtaking cars that were faster in a straight line, but slower through the turns, meaning I had to strategize how to get in front of them and hold my position. A few times I was able to use lapping traffic to my advantage to get by the faster cars, and using their draft I was able to make those passes stick. I ended up having a great battle with Skip Yocom in his 240Z toward the end of the race. I would catch him in the corners, only for him to pull away on the straights. The white flag came out for one lap to go, and I was on his tail as I got a great run out of the last turn and down the front straight, so he was only able to build a small gap. I could tell he was overdriving the car, and anticipating a mistake about to unfold, I was ready when he got sideways in Turn 2. I navigated my way around him to make a clean pass and was able to run away to the checkered flag. That was such a fun race for me. The fact that the car had been crashed earlier that day never even crossed my mind; it was purely me, the car, and the pavement, working together to win the race. Not only did I win my class and finish 14th overall, but I ran consistently faster each lap, knocking 1.5 seconds off my personal best time, putting me just a few tenths off of my dad's times. The rest of the weekend went great for me as well. I continued to improve, running consistent laps and feeling more confident than ever. Races 2 and 3 were similar, as I had to find a way past those cars that could beat me in a drag race, but would hold me up through the turns. 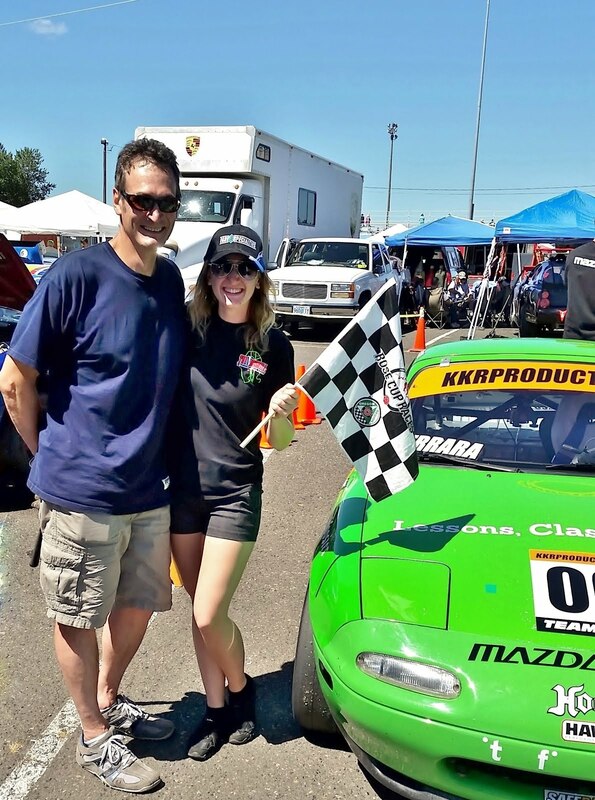 While frustrating, these situations helped me develop my race craft and build upon my skills. 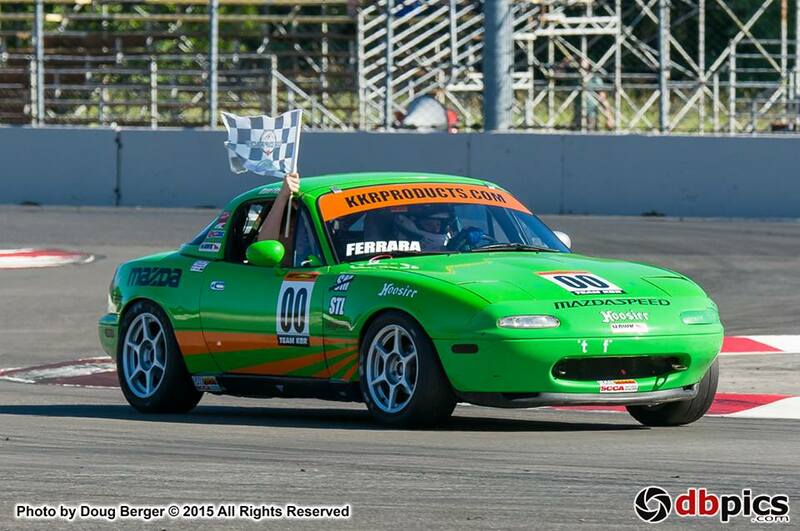 All in all, I won my class in all three races and had a weekend filled with fun racing. Dad had a great couple of races as well, keeping the car intact, on the track, and in one piece. He ended up finishing 11th in both races, just behind the large front group. He always had someone to chase down and someone else knocking on his bumper trying to get by. Overall, a very fun and successful weekend! Thanks to everyone who came out to watch, support, and compete! It was a blast hanging out with all of our friends and we are looking forward to our next race.